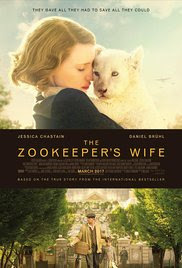 Summary from IMDB: The Zookeeper's Wife tells the account of keepers of the Warsaw Zoo, Antonina and Jan Zabinski, who helped save hundreds of people and animals during the German invasion. Review: No matter how many movies, or stories I see about world war 2, It never ceases to amaze me about how cruel people can be and how utterly fearless others are in the face of such atrocities. I didn't know going into the movie that it was based on a true story, not that it would have changed anything. This movie was a deeply emotional ride. One that I will not easily forget. The Zookeeper's wife saved over 300 Jews from being sent to the death camps. At one point, the zookeeper himself helped children on to the train, knowing full well where they were headed, but had no power to stop it. I couldn't imagine how hard that would be not to break down and cry. This was a great movie to watch and I would recommend it to anyone who likes to be emotionally moved. I can't wait to pick up the book.